did you happen to see a biker scout there? Yes, that figure was there, as was Vader. 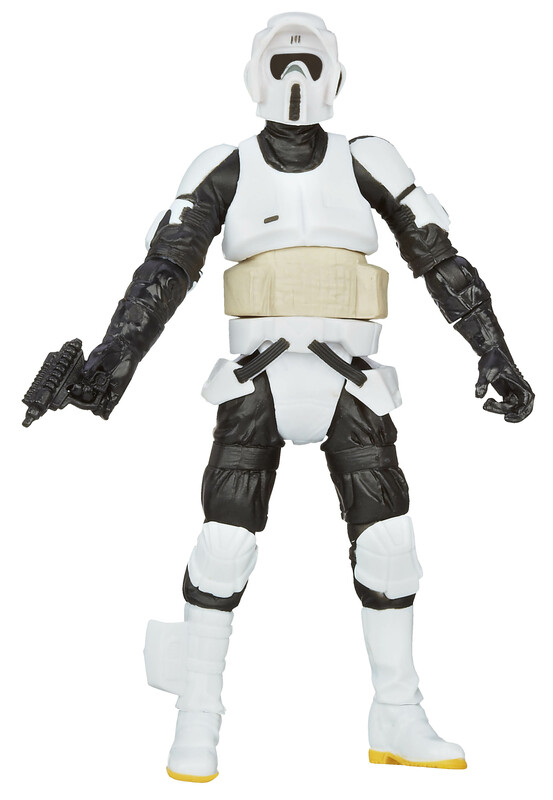 I passed on the Scout Trooper since I already have the one that came out with the Speeder Bike last year (I think that this new Scout Trooper is a repack of that one, with a possible slight deco change). And I can wait on the Vader, since I bet we'll be seeing a lot of that figure for the rest of the year. Not being a carded collector, I don't usually care about the packaging, since it all ends up in the recycle bin anyway. But I really like the size of the new card. It's noticeably narrower than previous cards; and to my eye, it gives a sleeker aesthetic presentation. The coloring of the card is a bit boring: just a black card with some orange stripes down the right side, and the logo at the top along with a graphic of the character. The cardback graphics are wholly unremarkable and, to me, uninteresting. So, all in all, I give them props for reducing the size of the card. Other than that, snooze. Now, the figures are fabulous - what you would expect for the collector line in terms of sculpt and articulation. And I am glad to now have my definitive AOTC Anakin Skywalker. I saw two TBS Scout Troopers at another Target today, and the visor on each one looked like it should, i.e., like the visor seen in the second link you provided. that's not a real person? Two Targets & nothing! Will let ya know if I find anything iny my neck of the woods. Dry thus far! Haha! Yes, that's Natalie Portman. I just thought the pic looked cool, and it is relevant to the figure in wave 1. I stopped by at the Target near my work last night, and I was able to get the 6" Luke Skywalker figure. Phenomenal collectible! These are far more impressive when you get to see them in person. My family and I went to Target tonight to get groceries, and I was able to get the 6" Darth Maul figure. Certainly happy for you and your findings!